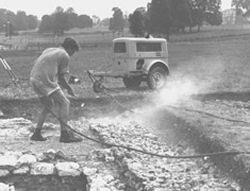 The Gadebridge Roman Villa | The Dacorum Heritage Trust Ltd.
On 22 July 1963 a young archaeologist, David S Neal began a five year excavation of a Roman villa in Gadebridge Park, Hemel Hempstead. Twenty seven years later, on 17 July 2000, Dr Neal returned to the site with his son Justin and a team of volunteers, and began re-excavating part of the villa. Why did they go back and re-excavate it and what exactly did they find? Where is the villa site? The Gadebridge Roman Villa is situated in Gadebridge Park about one mile north of Hemel Hempstead, adjacent to the Leighton Buzzard Road, just beyond its junction with Galley Hill. 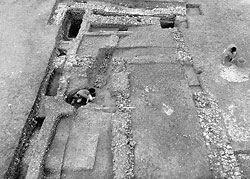 Several other Roman villas have been discovered in the Dacorum area at Boxmoor, Kings Langley and Northchurch. When was the villa discovered? The site was first discovered in May 1962 when workers using bulldozers to construct the Leighton Buzzard Road uncovered some masonry (later identified as part of a swimming pool linked to the villa). Members of the local history society were called in and discovered nails, tesselated pavements and bits of pottery. Dr I Anthony, the Curator at Verulamium Museum, confirmed that the site was Roman. The discoveries led to the formation of Hemel Hempstead Excavation Society which, with financial support from the Ministry of Works, Hemel Hempstead Borough Council and various learned societies, sponsored the excavations that took place during the summers of 1963 to 1968. 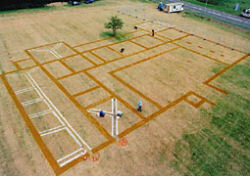 The excavations of the Gadebridge Roman Villa are inextricably linked to one man – David S Neal. He first came to Hemel Hempstead as a youngster in 1950 when his parents moved from London to Homefield Road. 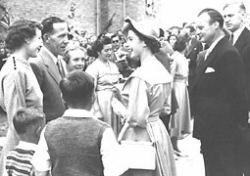 As one of the first four New Town families, the Neals were chosen to meet the Queen when she visted Hemel Hempstead in 1952. After attending Adeyfield School David went to art school and gained a national diploma in graphic design. He then worked as a designer with the Eastern Gas Board before becoming an archaeological illustrator with with the Ancient Monuments Inspectorate for the Ministry of Works. He had always been interested in archaeology and had worked as a volunteer at digs in St Albans during his summer holidays. He became noted for recording mosiacs and drawing archaeological objects. After a while, he was in charge of the archaeological drawing office for the Inspectorate. In 1963, David Neal, now aged 22, was employed to lead the excavation of the Roman villa at Gadebridge. This was the first excavation he had directed. What did they find during the 1960s exacavations? On the gentle hillside slopes above the pool, extensive remains were soon uncovered. Firstly a bath house lying near the pool and later the considerable walls of the villa itself were exposed. The site is thought to have been occupied for well over three hundred years, so it is not unreasonable for many changes to have taken place. Originally, it was probably a farmstead, but after the Roman invasion of AD43 its importance as a farm near to the Roman city of Verulamium would have caused it to be extended. During the Antonine Period (AD138-161), a stone building with corridors and wings was erected, probably covering much of an early timber structure. 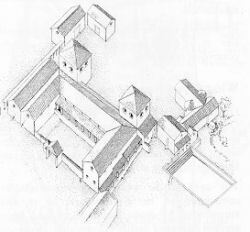 By the early 3rd century additional wings had been built to create a courtyard and the bath house was further enlarged. Between around AD300 and AD325 a large swimming pool had been added and had a considerable number of heated rooms. The swimming pool – seen here – is the largest one to have been found on a Roman villa site and only the large bath at Bath surpasses it in size. The water was supplied from the nearby River Gade and at the bottom of the steps there are small holes for fish to seek refuge. By AD325 the villa had reached its most complex phase. The main building now comprised two storeys and had facilities for drying corn as well as the heated rooms and nearby bathing facilities already referred to. However, it would appear that the villa was deliberately destroyed around the middle of the fourth century and the area seems to have been given over to stock rearing. The site was sealed with protective materials prior to being re-covered in order to secure its long-term survival. The road was completed, part of it running over the swimming pool. It was also “scheduled” in order to protect the site against any development. 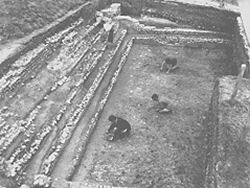 In the following years, David gained further experience of excavating Roman villa sites most notably at Boxmoor House School from 1966 to 1970, at Gorhambury near St Albans from 1972 and at Northchurch in 1973. He also wrote up his results from Gadebridge in The Excavation of the Roman Villa in Gadebridge Park, Hemel Hempstead 1963-8 which was published by the Society of Antiqueries in 1975. Why did Dr Neal re-excavate the Gadebridge Roman Villa in 2000? It was while working on some of the other villa sites that Dr Neal realised that many of them had evidence of early occupation – rectangular and circular groups of post holes which are the remains of the supports of late Iron Age building structures. These had not been identified at Gadebridge during the 1960s excavations. In early 2000, following a meeting with Dr Neal, Mike Stanyon, Dacorum Borough Council’s Community Heritage Officer, sought permission from the Department of Culture, Media and Sport to re-excavate a section of the villa site. This was a section that Dr Neal had not had the time to fully excavate during the 1960s, a section which he considered would be most likely to hold traces of early occupation. This area was originally considered to be a courtyard as it was surrounded by stone walls which had been erected on top of earlier occupation. However, within this area the remains of a hearth and stone quern or hand mill were found. In later excavations these have only been found inside buildings and it is this that provides the reason to suspect that the site might be earlier than originally thought. Permission was eventually granted and funding was provided by Dacorum Borough Council as a millennium event. The excavation lasted a month and was organised by the Dacorum Heritage Trust, the area’s museum service. Most of the volunteers were provided by Berkhamsted & District Archaeological Society. The excavation was also caught on camera by members of Hemel Hempstead Moviemakers. As well as re-excavating part of the site, Dr Neal and his team also marked out the outline of the villa walls using sand and the hypocaust systems using white paint. An aerial photograph was then taken – seen here. What did they find in 2000? The month-long re-excavation revealed evidence of earlier wooden structures on the site which were associated with the villa and date back to AD 75. Perhaps the most exciting discovery was that an earlier structure exists underneath the large bathing pool. Dr Neal initially considered this to be a mill but after further thought is now of the opinion that it is an earlier bathing pool. We have an exciting Roman themed loan box for schools available. It includes authentic replicas of Roman items and costumes for dressing up! Please see here for more information.